MICROWAVE morsels in medium, uncovered, microwave-safe bowl on MEDIUM-HIGH (70%) power for 1 minute; STIR. Morsels may retain some of their original shape. If necessary, microwave at additional 10- to 15-second intervals, stirring just until morsels are melted. 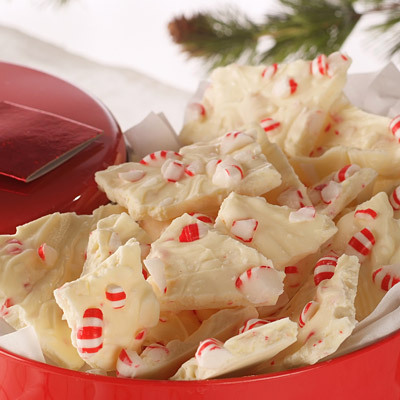 PLACE peppermint candies in heavy-duty plastic bag. Crush candies using rolling pin or other heavy object. While holding strainer over melted morsels, pour crushed candy into strainer. Shake to release all small candy pieces; reserve larger candy pieces. Stir morsel-peppermint mixture. SPREAD mixture to desired thickness on prepared baking sheet. Sprinkle with reserved candy pieces; press in lightly. Let stand for about 1 hour or until firm. Break into pieces. Recipe makes 1 pound of candy. Store in airtight container at room temperature.